Can Long-Term Physician-Patient Relationships Be Bad For Your Health? I wonder how many problems like non-compliance, usually attributed to “poor patient behavior,” actually stem from long-term physician-patient relationships in which both parties have just given up. You know what I mean…physicians who have treated certain patients long enough that they believe they are just plain never going to do what they are told…and patients with expectations for care and service from their physician that never seem to be met. Like any long-term relationship, people become used to one another and develop coping mechanisms to avoid an outright breakdown. People in long-term become complacent with one another’s “quirks.” We are all too willing to settle for the things as they are and not push the boundaries of the relationship hoping to improve it. But there is a long-term cost to the patient and physician when we ”settle” and try to just get by as the graphic below suggests. At face value, most physicians and patients don’t do a great job when it comes to communicating with one another. Take patient expectations . Most people have certain basic expectation for what we want to happen when we consult our physician. At a minimum we expect to have the time and opportunity to tell the doctor why we are there. After all, if we are concerned enough to make an appointment we want to be heard. Maybe we also have an expectation for a specific service – say a test, a referral or a new medication. 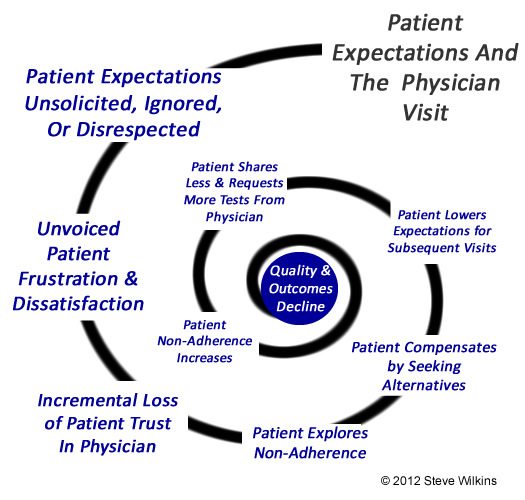 Quite often however, patient’s expectations, reasonable or not, often go unmet. According to researchers, physicians failed to ask for patient’s full reason for their visit in 77% of visits. Maybe the physician has little time to allow the patient to ramble on or maybe the physician has already arrived at a diagnosis already. The reality is that the patient’s expectations were unmet perhaps resulting in disappointment and perhaps frustration. Unfortunately, as Avedis Donabedian, MD, once said, “patients are overly patient with their physicians” and are willing to put up with a lot without saying anything (or reporting it on patient satisfaction surveys). Not every patient request for a test, referral or medication is appropriate. Physicians have an obligation to deny inappropriate patient expectations. But again, depending upon how well the physician explained their reasoning for the denial, some patients will be disappointed and perhaps even angry. Another study found that 56% of patients expressed an expectation for a specific service – a test, referral or medication… with 50% not getting what they asked for. Now imagine playing this scenario playing out between patient and physician 2 or 3 times a year over a number of years. I have to believe that in situations like this patients continually lower their expectations of their physicians…and along with it their trust, willingness to share information, and a willingness to comply what the physician recommends. Physicians for their part probably reciprocate these feeling in some way. The point is that settling and being complacent can be bad for the patient’s health and very unsatisfying for the physician. Too bad we don’t measure patient and physician complacency…it could probably explain a lot. Peck, B. et al. Do unmet expectations for specific tests, referrals, and new medications reduce patients’ satisfaction? Journal of General Internal Medicine, 2004; 19(11), 1080-7. This entry was posted in Uncategorized and tagged doctor-patient communication, doctor-patient relationship, infographic, lack of time, medication adherence, patient adherence, patient expectations, patient experience, patient requests, Patient-centered Communications, physician attitudes, physician-patient relationship, trust. Bookmark the permalink. Funny that my 60yr. friend just said to me, “You are a Healthcare Administrator, do you think having the same Ob/Gyn for all these years is not good for my health?” Her concern was that she had a cone biopsy many years ago and she thought that something was done wrong and “too much was taken”. She is a timid type patient who wouldn’t think to say this to her doctor. She wanted to know if she should see another doctor who could confirm her fears, who would say, “Who did that bad job on you?”. Thus, she would get the care she suspects she could be getting. I thought about it and she is right, due to malpractice fears today, what doctor would say to her that they made an error, if they did? I always thought Continuity of Care was important and was upset that each time I changed jobs, my insurance company changed and I had to select a new doctor. Maybe that isn’t so bad? A second opinion without confronting your doctor of many years may improve your health. The article got me thinking. The chart in the article was very fascinating. I did remind her that the technology wasn’t as good then as it is now, and she should speak to her doctor (since I can’t give her medical advice). If she is still uncomfortable wondering, she should get that second opinion! Then she can decide if it is time to change doctors. She should select an office with modern technology and maybe some younger doctors. This will not save our country the costs of new testing, but it will ensure better care. Accountable Care, Medical Homes and Employers - Do Physicians "Get" the Concept of Providing Value? Subscribe to New Blog Postings!